Peak power isn’t always the optimal situation for lasers. Yet more often than not, when operators set up their machines, they try to dial in the maximum power output, tuning it to get that peak power without realizing that’s probably not the most efficient setting. As lasers get more and more powerful, this is becoming more and more of an issue. When a laser is put to work, it needs to be monitored to make sure it’s working at its best. And because laser systems can degrade over time, the quality of a new laser system can be suspect until it’s truly put to the test – all good reasons to measure the beam on a regular basis. Analyzing the beam takes precision equipment, but when done correctly, a comprehensive accounting of a laser operation’s inefficiencies can be identified and corrected. Unfortunately, many laser users aren’t aware that such measuring equipment even exists. Russ Leikis, a software engineer with Ophir-Spiricon Products, a division of Ophir Photonics Group, explains that at some point, manufacturers utilizing laser technology will require assistance in optimizing their beams. His experience is that some manufacturers, especially those running smaller shops, aren’t even aware that the beam needs to be analyzed and tweaked. Ophir, however, is well-equipped to offer assistance in this regard, considering the company produces beam-profiling systems comprised of cameras, software and accessories specifically for this purpose. “We work with laser manufacturers and integrators to try to promote this,” Leikis says of the educational component regarding analyzing and optimizing beams, adding that the industrial market is “a little slower” to adopt the technology than other markets. Ophir products were initially used in the scientific community, but the company has since branched out into different industries, including medical and defense. Now that laser beams are becoming more powerful in the industrial sector, manufacturers are picking up on and adopting Ophir’s technology. Some laser operators approach the process of adjusting the beam in what Leikis refers to as an “uniformed” manner. This often includes adjusting the beam to maximum output. “I can recall cases where we have companies continue to increase the power output of the laser and keep cranking up the power and overall, that degrades the quality of the work they’re doing,” he says. Leikis explains that more power isn’t necessarily the right answer, especially if the laser doesn’t have a beam shape conducive to the type of work being performed. Optical elements are used within the laser cavity to hone the beam in specific shapes, including top-hat, square, round and rectangular, with uniform intensity. Leikis notes, however, that during the laser’s lifetime, the elements often require adjustment to maintain peak efficiency. “The need for beam analysis has been accelerating even more as lasers gain in power and kilowatts,” he adds. In many cases, the Ophir industrial customer knows generally what type of beam profile they need for a specific application. Leikis says they have some expectation of what the laser should be, yet they don’t have the ability to determine if they’re actually achieving that profile – and that’s where Ophir comes in. Ophir’s expertise began when the company was founded in 1976 when it started making laser power meters, energy meters and beam profilers. Three years later in 1979, Spiricon was established and started manufacturing pyroelectric sensors and beam profilers. 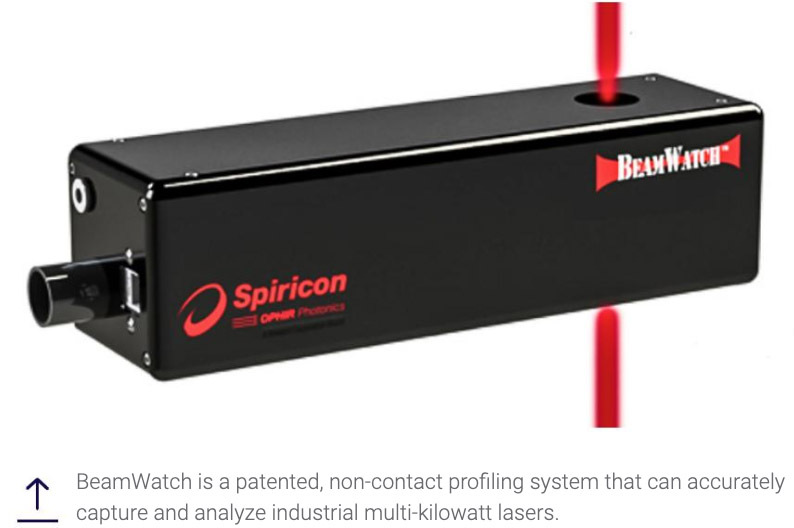 Fast forward about 40 years to 2016 to Ophir’s acquisition of Spiricon in 2006 and then Photon in 2010, and the combined leaders in laser beam profiling now also make a variety of beam profilers and accessories to make sure customers’ lasers can be measured regardless of size, power or wavelength. 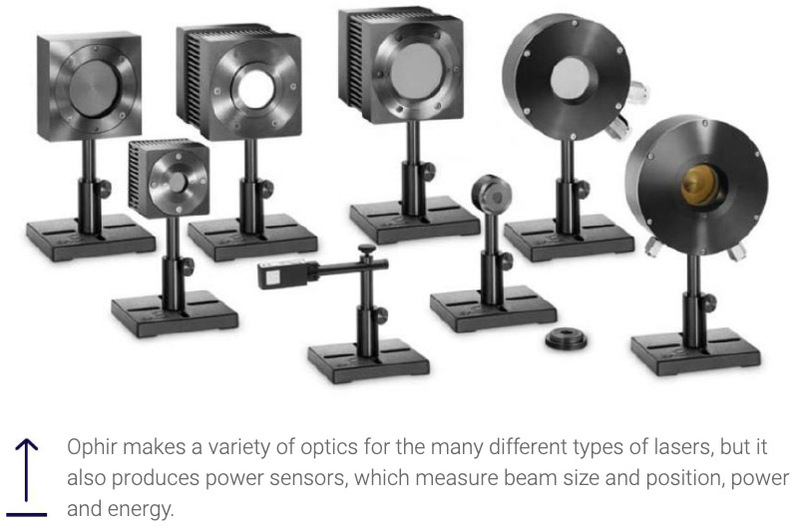 With such a high concentration of beam experience, Ophir’s laser power sensors can analyze lasers from 10 pW all the way to 100 kW. The laser energy sensors can handle anything from 10 pJ to 40 J. The beam profilers analyze beam width and overall intensity profile. Power meters allow users to display their laser power and energy and establish averages and create logs. The meters are made with and without displays. They can be connected to personal computers for use with Ophir’s Starlab power meter software as a virtual display for data logging and charting. Or, they can be combined with Ophir’s BeamGage beam profiler software for simultaneous measurements. Given the strength of some of the lasers on the market today, choosing the right optics and detectors to analyze the beam is important because the components can be damaged. Furthermore, the beam must be attenuated to some degree so the detector isn’t ruined. Higher power lasers open up more opportunities in manufacturing, but there are complexities involved, including something called focal shift. Focal shift occurs when optics begin to heat up and the focal point of the laser beam shifts, in some cases up to 8 mm. Leikis says Ophir-Spiricon developed the first product that shows how a laser fixes its focus in a live format. Until Ophir developed a product called BeamWatch, a non-contact profiling system, there was no way to dynamically measure the focus location of the beam, particularly in the crucial first few seconds when the delivery optics begin to heat up and cause the focal shift. Thermal expansion of the delivery optics can also alter the power density at the spot of the workpiece. 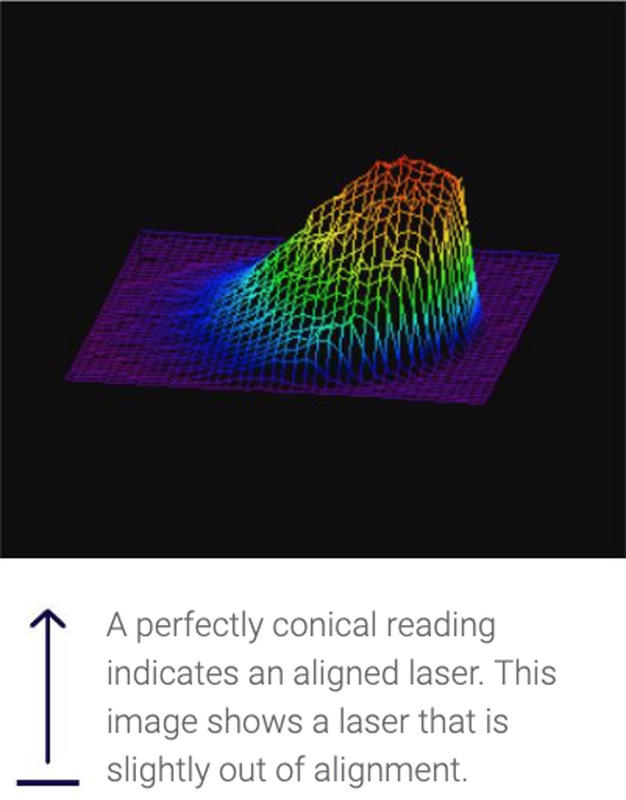 According to an Ophir tutorial regarding BeamWatch, higher laser powers present stresses on laser components, which includes focal shift. 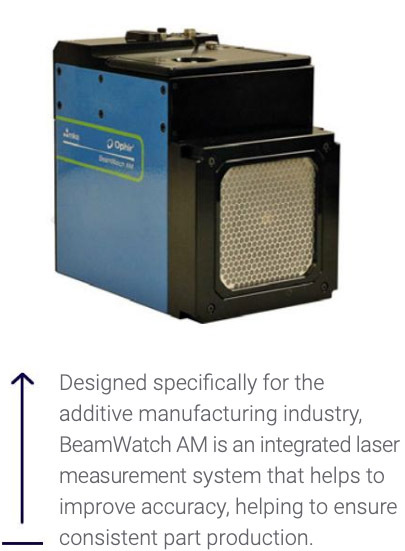 Fortunately with BeamWatch, manufacturers can determine “exactly where the focused spot is with respect to the parts being processed,” which is vital in most industrial laser applications. For example, if the work surface is placed where the “waist” or smallest part of the beam is located, but then during the process, the focus shifts, the beam size and shape at the work surface changes. This can reduce the efficiency of quality of the work being performed. Like the trend toward higher power levels, additive manufacturing (AM) is growing in popularity, as well. In fact, AM has grown to such a degree that Ophir now offers a product to assist clients to improve standards related to serial production. 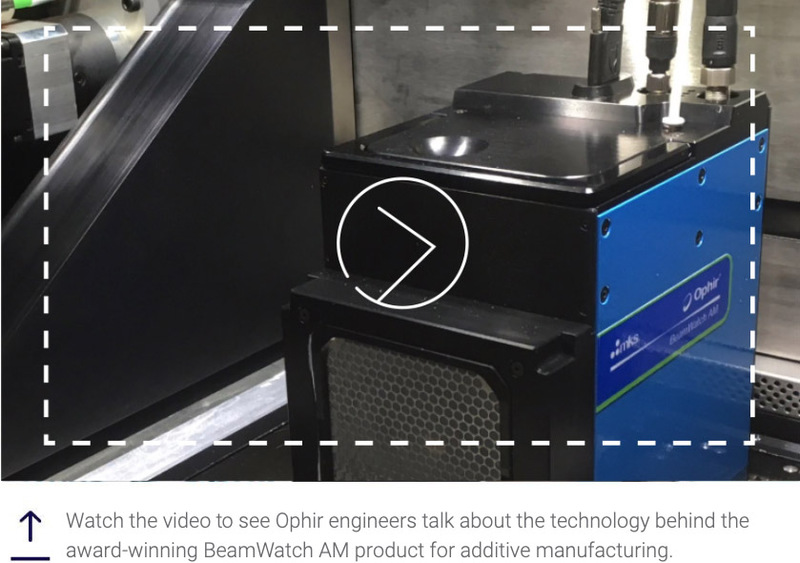 One of Ophir’s newer product lines is the BeamWatch AM, which is an integrated laser measurement system designed to analyze critical laser beam parameters for laser-based AM systems. Beam analysis is critical in AM due in part because the process is so complex. Precisely adjusting the system is difficult given the many integrated components in a small area. BeamWatch AM, however, provides simultaneous measurements of multiple profiles along the beam caustic (caustic refers to the envelope of light rays reflected or refracted by a curved surface or object) within the camera’s field of view. The real time measurements include divergence, beam parameter product, absolute power, tilt angle, centroid, waist (focus spot) width and location, focal shift and Rayleigh length, which refers to the dispersion of electromagnetic radiation.